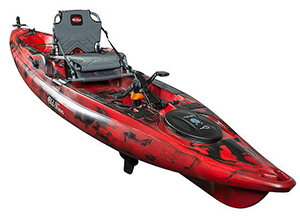 In case you get tired of paddling, Pescador Pro sit-on-top kayak uses a pedal drive. Kayaking is one of the simplest and safest outdoor recreational activities. Just about anyone can jump aboard, grab a double-bladed paddle, and start exploring. A few years ago, most kayaks were general-purpose boats. Today, there are a variety of specialized designs that have evolved for different applications. To get started selecting a kayak, your first task is to identify the type of kayaking that you are likely to be engaged in most of the time. What type of paddling do you do? Where will you kayak - calm ponds, lakes or rivers or open water with wind and waves? What distance will you travel - short distances, long day trips or multi-day touring, with camping gear carried aboard? What is your experience and your level of skill? Recreational kayaks are made for all-around casual use on calm lakes, slow-moving rivers and flat-water bays. They are shorter than touring kayaks (most are 10'-12' in length). They’re beamier, with flat bottom shapes so they turn more easily and have more initial stability, but do not hold a course in a straight line as effortlessly. Large cockpits provide easy access. Most do not include a skeg or a rudder. If you are new to the sport, a recreational kayak would probably be a good choice. Longer, narrower kayaks go faster once they are up to speed and track in a straight line better. Touring kayaks are made for weekend trips with the gear that you carry along, have small cockpits and storage compartments to hold gear stored inside of waterproof dry bags. Some of the higher-priced boats are made of fiberglass, and are very long (17' for a single, to 22' for a tandem) including waterproof bulkheads and fiberglass hatches in the deck. Multi-week voyages under near-offshore conditions are possible with the top-end touring kayaks. They are sometimes described by the name “sea kayaks,” but are not used only in the ocean. Some touring kayaks have a rudder, connected to foot pedals, to improve steering and turning ability. 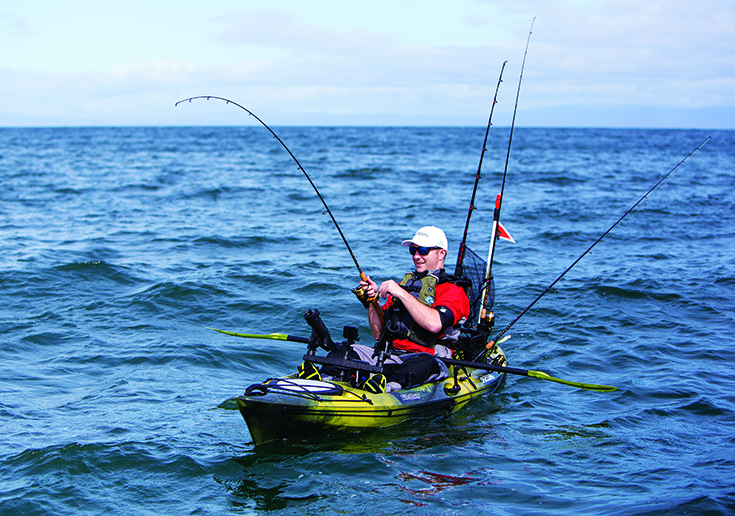 This sit-on-top West Marine Pompano 120 Kayak is loaded with every fishing accessory imaginable (sold separately). Built for anglers or divers, special kayaks such as the Pompano 120 and the Pescador Pro include baitwells, fishfinder mounts and transducer scuppers, tackle boxes, rodholders and many other features just for anglers or divers. Note also the large number of fishing accessories made expressly for kayaking, as companies like Scotty have discovered the popularity of this type of angling. Specialized boats for whitewater use are often very short in length with planing hulls and lots of rocker (with raised ends) for maneuverability and for handling waves effectively. Waveskis are a type of short kayak designed especially for surf use. They are usually of the sit-on-top style, and are very easy to reboard after a wipeout. Will you be kayaking alone or with a partner? A tandem kayak is lots of fun to paddle with a partner and less expensive than two single kayaks, but is difficult to paddle alone (which requires sitting in the back and ballasting the front). Tandem kayaks are also faster than singles, since they combine the effort of two paddlers for one boat. They are good for paddlers of different strengths, who might not move at the same pace in two singles. Do you want a rigid kayak or an inflatable kayak? There’s an important tradeoff between performance and portability. A rigid kayak that’s 13' long just requires that much storage space in a garage, onboard a boat, on a dock or in your yard. Store your boat against a wall, using a wall storage cradle or storage strap system. Hoist the boat up to the garage ceiling with a Kayak Hoist System made by Attwood, or a Harken Hoister. Home-to-water transportation is usually on a cartop rack, a set of two crossbars that attach to the car via rain gutters, your car’s existing factory rack or that clip to the car’s door frame. A variety of towers and crossbars from Yakima and other suppliers are available to build a custom rack to fit most types of vehicles. Soft racks like our Deluxe Universal Kayak Carrier Kit are pads that work on any car and sit between the kayak and the roof of your car. Whatever style you choose, be sure your kayak is securely attached by tying bow and stern lines to the bumpers of your vehicle. Lifting your boat on and off the rack can be a simple, one-person task, depending on your size and strength, the height of your car and the weight of the boat. Rigid kayaks are made from rotationally-molded polyethylene, ABS plastic or fiberglass composite. Roto-molded polyethylene, the most popular hull material, is least expensive, incredibly durable but heavier. Thermoformed ABS plastic is lighter and stiffer. High-end kayaks are made from fiberglass, sometimes including aramid or carbon fiber with vacuum-bagged epoxy or polyester gelcoated hulls. Very light, extremely stiff and lively, but must be treated more carefully because they’re more fragile and expensive. Portability is the primary advantage. Most inflatable kayaks fall into the “basic recreational boat” category, but the Advanced Frame models like the Scout offer a higher level of performance. Scout’s design is a hybrid of a folding and an inflatable kayak, with aluminum frames adding rigidity to the bow and stern. Due to their length and seaworthiness, these kayaks offer performance comparable to hardshells, but are easy to setup and compact to stow. Do you want a sit-inside or sit-on-top kayak? Best for colder conditions, because they provide protection from the elements for your lower body, having a small oval-shaped deck opening with a nylon fabric “spray skirt” that seals your lower body inside, allowing you to stay drier. Your center of gravity is lower, since you are sitting below the waterline, so you have greater stability. You can also brace your lower body better, so you feel more connected to the boat, and can handle rough water more effectively. If you’re looking for a kayak that’s more of a travel vehicle, and less of a toy, a sit-inside boat may be the best choice. The downside is that recovery from a capsize is more difficult. Practicing an Eskimo roll to get upright and learning how to disengage yourself from the spray skirt are required. You’ll also need to bail out a boat that is full of water. Great for warm weather fun, sit-on-top kayaks mostly fall into the “recreational” category. Sit-on-top boats are self-bailing because the floor is above water level and is fitted with scuppers, holes that go through the bottom for drainage. They’re hard to capsize, but tippier than a sit-inside kayak because your center of gravity is higher. If you do flip over, self-rescuing recovery is easy, about like climbing back on a surfboard. This easy boarding access makes sit-on-top kayaks the most popular fishing, swimming or diving platforms. They’re generally wider, heavier (45-75lb.) and slower than sit-inside boats. The tri-form hull shape of most sit-on-tops combines both primary and secondary stability with a long center keel to keep you going straight and two “shoulders” that act like sponsons for secondary stability. Since you are not inside a skirted cockpit, expect to get wet, and wear a swimsuit (or a wetsuit) because you are exposed to the wind and waves.